Make a Tajik Air reservation and find some amazing deals with discounted Tajik Air tickets at Alternative Airlines. Pay for Tajik Air flights in Russian Ruble , USD or 70 other currencies of your choice with Alternative Airlines. Tajik Air, also known as Tajikistan Airlines, is the national airline carrier of Tajikistan. Tajik Air serves 19 destinations, including Almaty, Bishkek, Urumqi, Sharjah, Tehran, Istanbul, Munich, Ekaterinburg, Moscow Novosibirsk and Samara. Tajik Air has a codeshare agreement with airBaltic. The airline has its main hub at Dushanbe International Airport and it retains a secondary focus point at Khukand;s Khudzhand Airport. The Tajik government has ordered the relevant agencies to take necessary steps to launch a direct flight to Aremenia. Agreements signed in Yerevan last year regarding air communication are set to be approved. The Uzbek national airline, Uzbekistan Airways, has offered the opportunity of new flights linking Samarkand and Bukhara to the Tajik capital of Dushanbe. Flights ceased between ther two naions in 1992 due to political tensions ans in 2000a visa was introduced for Tajik nationals. Relations have recently seen a marked improvement but things are on the right track in terms of diplomacy. This may make flight connections for the 2018 World Cup easier. Make a Tajik Air reservation and find some amazing deals with discounted Tajik Air tickets at Alternative Airlines. Tajik Air flies to 19 destinations worldwide, offering a cost effective and safe service to all its passengers. Let Alternative Airlines help find you cheap Tajik Air tickets and make international and domestic flight reservations on Tajik Air today. Browse the most popular Tajik Air flight routes to cities all over Europe and Asia. Alternative Airlines can help you make reservations on Tajik Air for international flights to lots of destinations within Europe and Asia. Use the booking engine to help you plan your next flight. 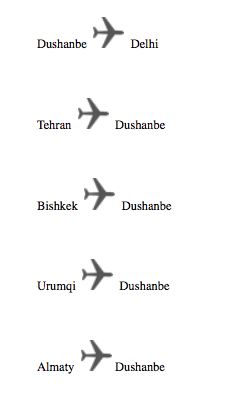 Book Tajik Air flights on Alternative Airlines to save big! Alternative Airlines is an online travel agency, specialising in booking lesser known airlines and remote destinations.